Cook AND serve in style with this reversible apron. 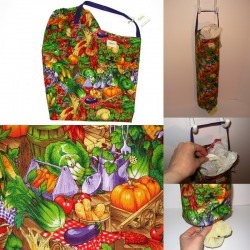 This apron is finished on both sides with two pockets on one side – have a spill while cooking? Flip it over and keep going. Neck strap and ties are generously fashioned to fit a variety of chefs. 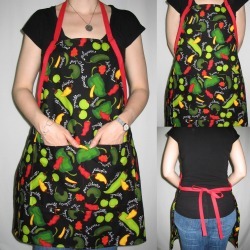 This apron features four pockets to hold all your bits and pieces for your crafting, gardening, DIY, and hosting needs. Finished on both sides for a clean look and longer life. Apron ties are generously fashioned to fit a variety of body types. 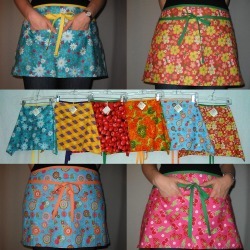 Reversible just like the adult apron, with a pocket on one side. 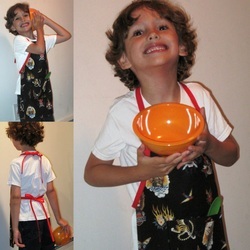 Ties at neck to adjust to fit as your little chef grows! The perfect way to dress up a party! Fabric flags are finished on both sides for a festive appearance no matter how you hang them - nine flags per bunting string. Bag organizers are available in assorted prints featuring dogs, cats, food, and more.